The clean classic design of these precast concrete planters will complement any indoor or outdoor setting. These planters are available in Smooth Stained finish for a sleek look or in a Weatherstone finish, offering the look and feel of rough concrete. 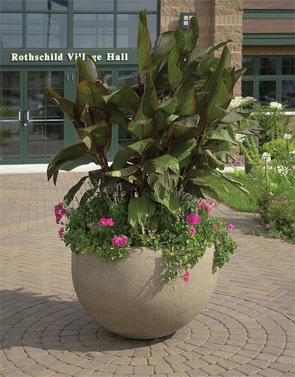 Planters are also offered in a Ground Glass Concrete finish that qualifies for LEED® points. Colors available for each style of finish are shown below. These precast concrete planters measure 36"Dia. x 24"H are constructed with 1/4" rebar and meet all ASTM C150-07 and C31 standards. Add the optional reservoir system which will extend plant lifespan while reducing the frequency of watering.